No matter where you live, you are probably on the move every day. Perhaps you head out to class or you’re about to face a long day of work at the office. Beyond how we spend our days, we go to stores to buy life’s necessities and to social spaces and other homes to see family and friends. As an American woman, I am very fortunate that I can easily leave my home and go about my business with relatively little fuss with my trusty car. In Saudi Arabia, women are not so lucky, with the restrictive society going so far as to ban female drivers completely. 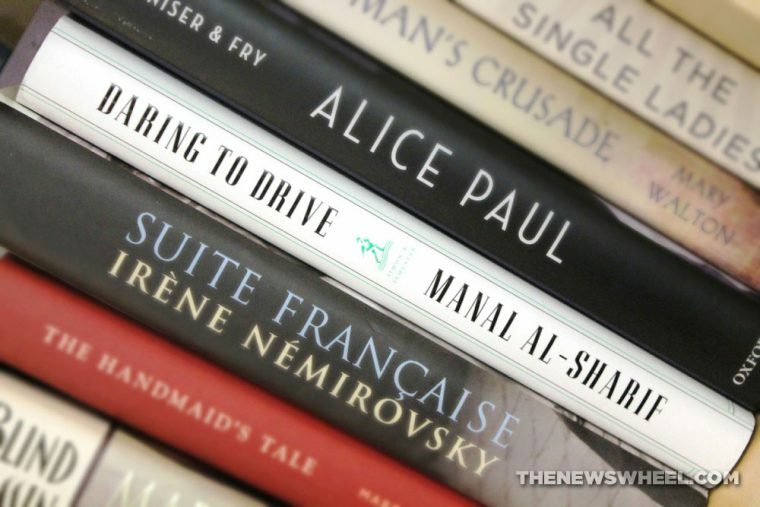 To learn more about this culture and the rules against women behind the wheel (as well as the fight against them), consider taking a look at Daring to Drive: A Saudi Woman’s Awakening by Manal al-Sharif. I will be the first person to admit that I judge a book by its cover. When I first picked up Daring to Drive, I was impressed by the clean design style that starts with the cover and continues throughout its pages. The tome was well constructed and it was sturdy enough to withstand the perils of my giant purse without its dust jacket. 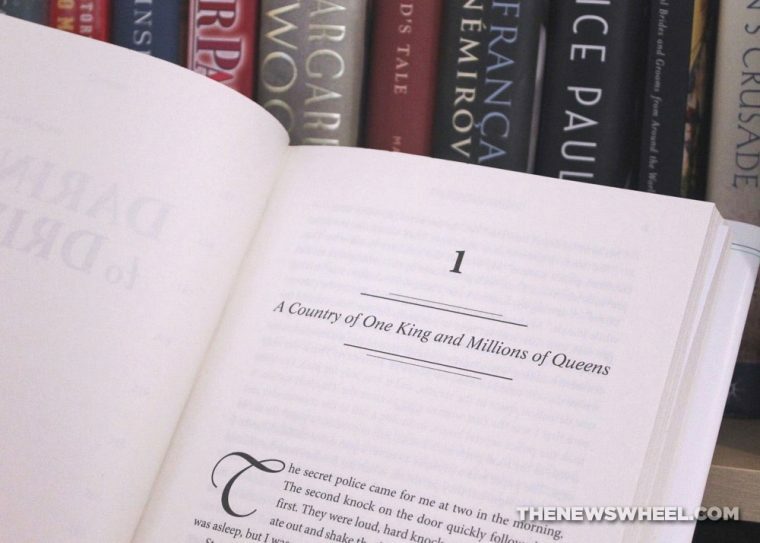 As for the story being told on the well-designed pages, it is essentially an autobiography of Manal al-Sharif, a women’s rights activist that made a splash in 2011 when she decided to drive a car in Saudi Arabia. This is not technically against any written laws in the country, but is against its cultural norms (which is just as bad, if not worse). Manal’s arrest by police in the middle of the night after her ride behind the wheel and the beginning of her prison sentence opens the book. From there, it is a narrative of her life, allowing readers to see what it is like to grow up in Saudi Arabia, an experience that actually made Ms. al-Sharif a very conservative Muslim. As she grows older and restrictions fall into place because of her gender, she has several experiences change her worldview. All of these different pieces come together to present Manal’s case for female drivers and women’s rights in Saudi Arabia. 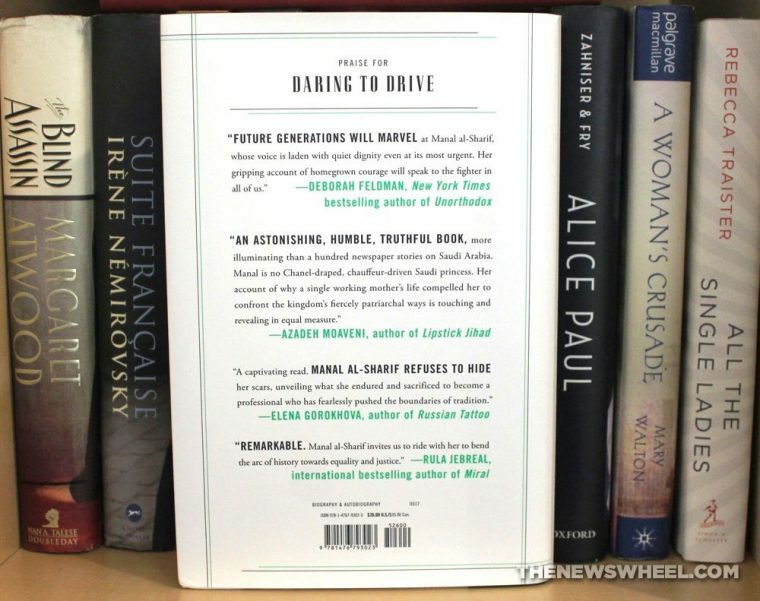 When we requested Daring to Drive from the publisher, I had seen it on several lists as a highly anticipated new read for June. After reading it, I can definitely can say that the hype was well-deserved. I am familiar with the ban on female drivers in Saudi Arabia thanks to our new “Leadfoot Ladies” category, but the book helped me see why the ban exists at all and how people at different levels of Saudi society feel about it and the possibility of change. Beyond the automotive aspects of the book, I was given a valuable look into the life of a Saudi Muslim woman and all the differences to my life in the western world. Before you pick up this tome, you should be aware that it is about so much more than a woman’s right to drive, and at times it can be very distressing when reading it with western eyes. This narrative highlights many of the other difficulties Saudi women face in their country, such as their constant segregation from men and the government’s refusal to recognize woman as people, independent of male guardians and chaperones. At a young age, Manal al-Sharif and her sister were held down in their home and subjected to circumcision, or female genital mutilation, to protect their virtues. While al-Sharif expresses love and respect for her parents and the sacrifices they made for her, the book has several references to them beating her and her siblings, as well as being sequestered in their apartment full of shouting matches. If you consider yourself interested in women’s rights or the cultures of other lands, Daring to Drive should be a mandatory addition to your reading list. Instead of the usual American or western writer (like me) explaining the situation in Saudi Arabia, the book offers a narrative from someone born into this culture and is the most qualified to speak about it. In the current times that we live in, where there are attempts at a Muslim ban and terrorist attacks fueled by ISIS in the west, Manal al-Sharif’s childhood journey to becoming a fundamentalist follower of Islam and her shift to a champion for women’s rights was very eye-opening and helped me understand the conflict more than before. Daring to Drive: A Saudi Woman’s Awakening is available through the publisher’s website, Amazon, and other retailers.